It is fun to take your own baby pictures and one of the keys to getting a great photo is the lighting.The right lighting can bring out details in your baby pictures like the twinkle in their eye and the silkiness of her hair. Good lighting makes a photo seem warm and inviting while poor lighting can make your subject look rather flat and lifeless. Indoor and outdoor, there are a few tips you should know for finding the best light for your baby photos. 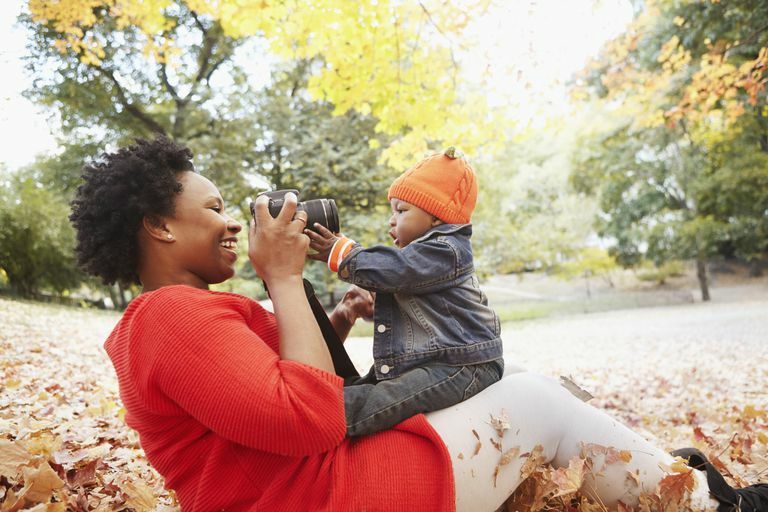 When photographing your baby outside, such as in a garden or at the park, the best lighting will be available right after sunrise or just before sunset. The bright midday sun produces harsh shadows and can cause your little bundle of joy to squint when you try to snap a picture. If you must take pictures during midday, try positioning your baby so he's under a tree or another shade source. You can use your camera's fill flash if you find that your baby's face is too dark. Fill flash helps "fill in" light when there would otherwise be shadows in an image. It is useful for balancing out extremes of light and dark in your baby pictures. To use the fill flash, you will need to override your camera's automatic flash setting. Also, stand less than 10 feet away from your baby so the flash is not too powerful and use the camera's zoom lens to get in nice and close. When taking baby pictures indoors, avoid using a flash whenever possible. Babies do not like having bright lights in their eyes. If you use a flash, you are likely to end up with tears or unhappy expressions instead of cute baby smiles. If it is practical, move toward a window and utilize the natural light from outside. Don't get too close, as this can make the light seem unnecessarily harsh. Move back a few steps and have your baby face the window at a 45-degree angle for the best results. Remember that you don't want to have the lights coming from behind your child. This will result in a silhouette for your baby photo. Watch for your lamps, chandeliers, and other light sources in the background. Nothing ruins a cute baby picture faster than red-eye. Fortunately, most digital cameras today have a red-eye reduction function that you can use when shooting indoors to help deal with this problem. If there is no way to avoid using the flash, make sure you know how to operate this feature on your camera. Taking baby portraits at home can be a good way to save money. You don't need a lot of fancy photo lighting equipment, either. Halogen work lights or desk lamps work well, are widely available and fairly inexpensive. Position the photo lights at an angle in order to minimize shadows. Have one light on each side and move one a bit closer with one to create just a little more highlight on one side. Don't forget about background light. Turn on a lamp and position it to light up the background so it does not look like your baby is hanging out in black space. Make sure that your background light is lower than the light on the baby or you will have a silhouette. Reflectors and diffusers can be used to enhance the lighting. Use a piece of white foam core board or foil-covered cardboard to make a homemade reflector and fill in the shadow areas. Move it around at an angle to the light source until you notice the shadows soften. Be careful with tin foil because sometimes you can catch too much light and point that into the baby's eyes. A translucent material, such as a sheer curtain or a light colored sheet with a low thread count, works well as a diffuser. Place this in front of the light source to soften the light and reduce the harsh contrast between shadows and highlights. Mastering the art of photo lighting takes a lot of practice. Even professional photographers struggle to grasp the proper techniques for lighting various types of pictures. Be patient with yourself and don't be afraid to experiment. The more pictures you take of your child, the better your baby photos will become.